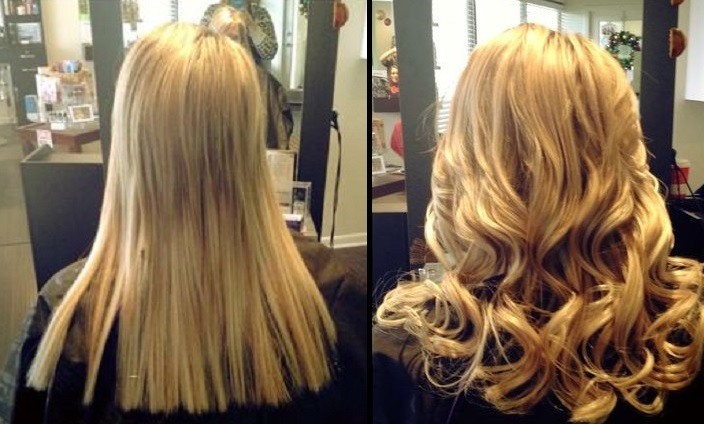 Once you’ve decided to take the plunge and have hair extensions fitted, how do you avoid a bad application? We’ve all seen terrible examples of tatty rats’ tails, even A list celebs with their amazing contacts and enormous bank balances can fall prey to awful hair extensions, so how do you make sure you don’t? When looking for a reputable hair extension technician one of the first things you should do is study their portfolio, but what should you be looking for? 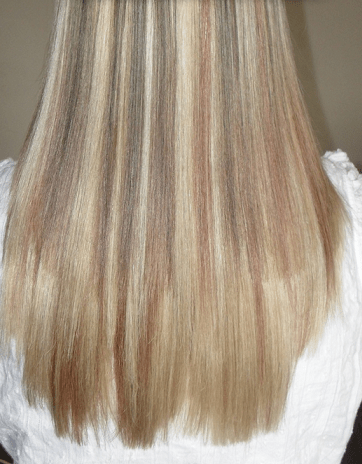 At NuTress we understand it’s not always easy to identify what separates a good set of hair extensions from a bad set, so we’ve put together this simple 5 step guide to help you avoid a mistake which might not only be expensive and disappointing but even more worrying, potentially damaging to your natural hair. This is the point at which the shortest, uppermost layers of your natural hair meet the extension hair. Blending is easy if the client’s natural hair is below shoulder length and layered, and/or fine/thin but successfully blending shorter layers and thicker hair requires experience and skill. When reviewing before/after photos be sure to assess how well the client’s shortest layer blends with the finished style and ask yourself, would you be happy with that look? This lady has been left with a severe “lid” at the top of her head, one of the most obvious and unattractive hair extensions giveaways. Not all examples of bad blending will be this obvious, make a point of looking in the crown and side areas when assessing blending skills. I wrote earlier that longer, finer hair was easy to blend but this technician is so lacking in skill/attention/sight(?) that this lady has been left with an obvious line running all the way around her head, not a good look! Selecting the correct combination and quantity of colours is crucial if your hair extensions are going to look natural. Natural hair is seldom made up of only one colour, even when applying black hair we might use two subtly different tones. Alternatively, you might want to add some high or low lights, this doesn’t mean your hair extensions should stand out from your natural hair. As with blending, try to identify where the clients own hair stops. If the result is unnatural and obvious either the technician is lacking in colour matching skills or they are using pre bonded hair extensions which limits their colour range and possibly how well they can match your own hair, not good either way. One of the most horrible mistakes a technician can make is not using enough hair, resulting in thin, stringy locks that look like rats tails. That said, some clients might want length but if their own hair is very fine or thin, or if they prefer a very tapered look adding too much hair can look false. If you’re looking for hair extensions to add length, bear in mind that having hair extensions shouldn’t only be about long hair, it should look stylish and natural too. 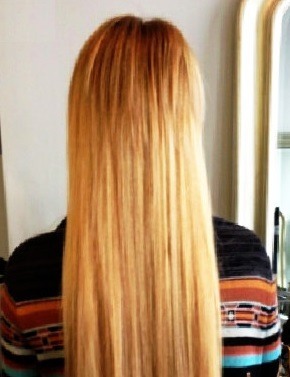 Even though this ladys hair extensions have been waved, her hair still looks thin and stringy. I doubt this is the look she had in mind. 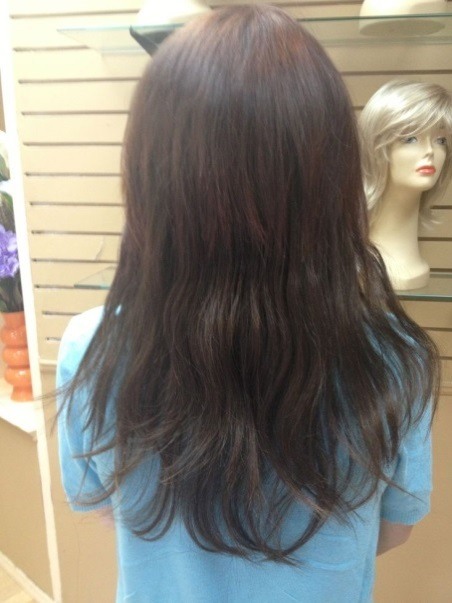 Cutting hair extensions is a totally different discipline from cutting natural hair, even the most experienced and skilled hair stylists can come unstuck when attempting to cut hair extensions. The best way to avoid the need to cut hair extensions, therefore leaving the tapered tip intact, is to adjust each extension to the required length prior to applying. 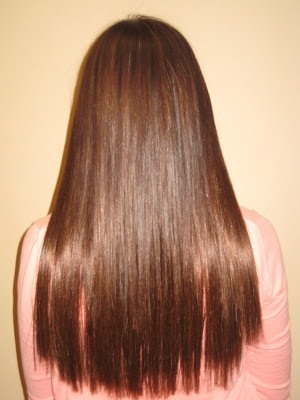 This technique results in a much more natural result, allowing the extensionist to build weight into the length line and to add layers without the need for heavy cutting afterwards. The ends of these hair extensions have been cut after application resulting in a very unnatural, blunt, choppy and disjointed look, an obvious sign that this lady is wearing a set of poor quality hair extensions. If all but the most simple (mid length, fine/thin hair) examples in a technicians portfolio are curled you need to ask yourself, why? We at NuTress love curls as much as anyone else but some sneaky techs use them to disguise a multitude of poor application sins including poor blending, blunt cuts and a lack of density. The poor blending and blunt cut of this application looks so much better curled but do you really want to be restricted to just one style? And with the SS14 catwalks full of long, straighter styles this look could be on the brink of its sell by date.